KONQER Sports Successfully Completes Expansion into Palau, Saipan — Returns to Guam for Finale. Tumon, GU – KONQER will complete its 2017 three-country event circuit with its third annual obstacle course challenge on Sunday, Oct. 15 at Gov. Joseph Flores Memorial Park, according to KONQER Sports CEO Kaz Endo. KONQER’s inaugural event was held at the Guam International Raceway in Yigo in 2015, and 2017 marked the first year the brand expanded regionally to Palau and Saipan. Similar to Guam Visitors Bureau’s support of KONQER Guam, the other events were strongly supported by both Palau Visitors Authority (PVA) and Marianas Visitors Authority (MVA). Despite getting a rainy and windy start courtesy of a tropical depression moving through the area, KONQER Saipan was also deemed an event worthy of repeating in 2018. 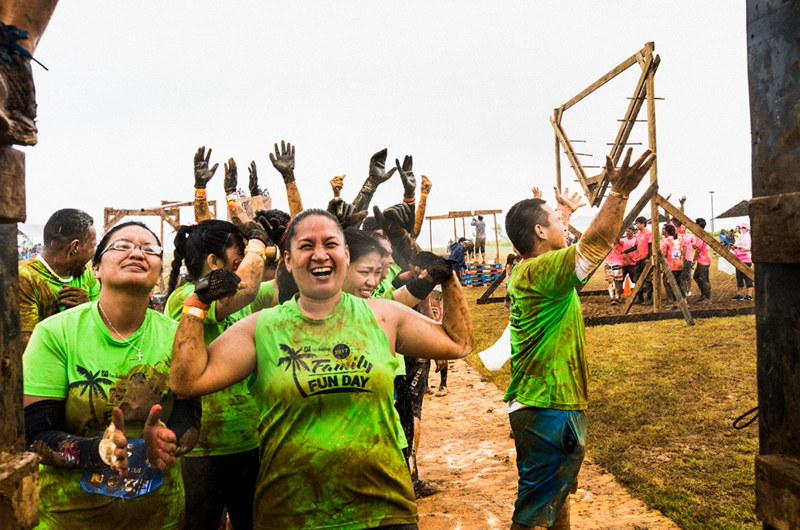 KONQER Guam – Storm the Bay is set for Sunday, Oct. 15 at Gov. Joseph Flores Memorial Park at Ypao Beach, and participants can look forward to more than two dozen manmade obstacles and localized challenges for people of all ages and fitness levels. Various divisions allow participants to tailor their KONQER experience, including the Enduro solo timed division for the most competitive athletes, the Completion division for those that just want to have fun and complete the course either solo or with a team, the Sprints division, for those who want to try their hand at the 15 manmade obstacles only, and the Business League, open to all businesses who would like to submit a 10- person team to compete for the top times. Individual registration is currently $100 per person, but, in order to encourage families to take on the KONQER course together, kids age 14 and under can participate completely free of charge, and students ages 15 to 17 receive deep discounts on registration fees. Online registration is available at konqersports.com, and registrants may use the promo code STORMTHEBAY to receive 25 percent off registration fees for a limited time. KONQER is presented by Guam Visitors Bureau, and sponsored by Bank of Guam, IT&E, Coors Light, Hanom Water, Mountain Dew, Go Pro and Trivision Media Group.